If you do not have the time or patience to strip, stain or paint that piece of furniture that you have been meaning to get done for years, let DCI's inmate refinishing program employees do it for you! 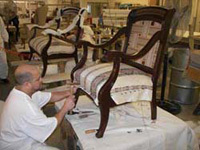 The workers are trained in specialty areas like chair caning, too! "Just wanted to let you know that the mantle is absolutely BEAUTIFUL. Your guys really did a fantastic job. Please pass on the compliment. Thanks! P.S. Even my husband said how beautiful it is. He doesn't really express excitement over furniture." "I just wanted to let you know Roberta and I are very pleased with the refinishing job done on the Sheet Music cabinet. Please pass on our thanks to the individuals who worked on this project. I will contact you when I have another piece to be done." "I wanted to let you know how please we were with the pieces that were done, they turned out beautifully. Thank you so much. If I decide to do more is that a possibility?" "Just wanted to let you know that my mom is tickled to death on how well the adult rocking chair and the rocking horse turned out.... even my grandmother was delighted... Mom told me to tell you thank you..."